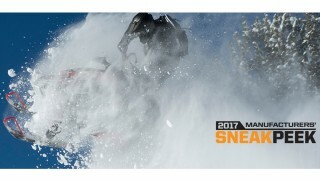 The 2017 snowmobiles are finally here and you can check them out in person by checking out of the 18 stops of the manufacturer’s Sneak Peek tour. Yamaha, Ski-Doo and Polaris have teamed up to bring their latest new snowmobile models with a tour starting in early March and ending in early April. Arctic Cat is not participating. Each manufacturer will feature their new models along with new technology displays, clothing and details on their spring retail offers. In addition, factory representatives and local dealers will be there to answer questions and give firsthand knowledge on the newest innovations. Also, several stops include information booths from state or provincial snowmobile associations and local clubs, providing great information on trails and other snowmobile related activities in the area. This year’s United States tour kicks off in Buffalo, NY on March 2nd and will make stops across the Northeast before concluding in Minneapolis, Minn. on April 8-9. To the north, the Canadian tour will commence in Quebec on March 11th and will travel west until reaching St. Albert, Alberta, and wrapping up on April 11th. In addition all four manufacturers will be displaying their new 2017 models at the Jackson Hole Hillclimb, March 24-27 in Jackson, Wyo. For complete tour details including locations and times visit www.snowsneakpeek.com.